Andrew Flintoff is convinced he can recapture his Ashes-winning form after the fourth operation on his left ankle. The England all-rounder believes Dutch surgeon Professor Niek van Dijk has finally cured the problem that had threatened to cut short his career. The 29-year-old told The Sun: "I'm absolutely confident I can get back to playing for Lancashire and England again to the level I have in the past. "The surgeon went into the joint and found things wrong." Flintoff had travelled to the Netherlands to be treated by Professor Van Dijk, who is considered one of the world's leading authorities on arthroscopic ankle surgery. "He removed some bone fragments that were deeply embedded and did some work on the tendon too," added Flintoff. "Professor Van Dijk is more than happy with what he has done and confident he has got to the bottom of the problem." 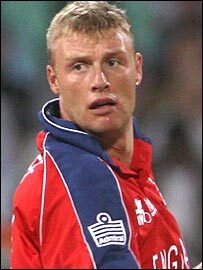 Flintoff now faces seven months of recovery and will miss England's tours to Sri Lanka in December and New Zealand in early 2008. But he has not set a date for a return to action, preferring instead to concentrate on getting his ankle back to full strength. "I'm not setting any targets about when I might play again - all I'm thinking about is when I can come off the crutches, which should be in a few days," he said. "We have a lot of time so the ankle can heal naturally. Time is one thing we have in our favour so there is absolutely no need to rush things. "I'm confident I can come back. It will be hard work again but I've been through lots of rehab programmes so I know what is involved."